Totem poles are monumental sculptures carved on poles, posts, or pillars with symbols or figures made from large trees, mostly western red cedar, by indigenous peoples of the Pacific Northwest coast of North America (northwestern United States and Canada's western province, British Columbia). 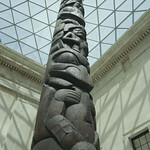 The word totem derives from the Algonquian (most likely Ojibwe) word odoodem [oˈtuːtɛm], "his kinship group". Totem poles are not religious objects, but they do communicate important aspects of native culture. Carvings of animals and other characters typically represent characters or events in a story. The carvings may symbolize or commemorate cultural beliefs that recount familiar legends, clan lineages, or notable events. The poles may also serve as functional architectural features, welcome signs for village visitors, mortuary vessels for the remains of deceased ancestors, or as a means to publicly ridicule someone. 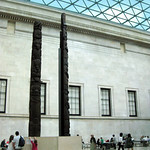 Given the complexity and symbolic meanings of totem pole carvings, their placement and importance lies in the observer's knowledge and connection to the meanings of the figures.